31 December 2018 Something curious has happened to the representation of architecture. Gallery walls, websites, photobooks and biennales are filling up with images of impossible structures. But they are not quite what you might expect; they are not impossible in an idealised manner. This isn’t sci-fi and it isn’t visionary design. We have post-truth politics and fake news: why not the same for architecture? There has always been — in art, in film and in architecture — a utopian strand which imagines cities of the future and expressionist architectures that project the desires of the age into structure. In fact architecture is itself utopian, as it takes so long to design and build that it inevitably launches into an unknowable future. It cannot be embarked on without an almost insane optimism. But this new phenomenon is something else, something stranger. The best place to start is with the now much-reproduced and eerily familiar work of Filip Dujardin. The Belgian artist and architectural photographer creates images of absurd buildings, piled up from the elements of actual structures digitally collaged into surreal assemblies. Some of these impossible architectures merely raise a smile; others, however, are genuinely unsettling because they feel as if they might be real. Dujardin plays with an uneasiness about contemporary architecture in which structurally almost anything could be possible by creating images of teetering housing blocks, stacked suburban houses and structures which blend the generic anonymity of modernism with the inge- nuity of the informal city. 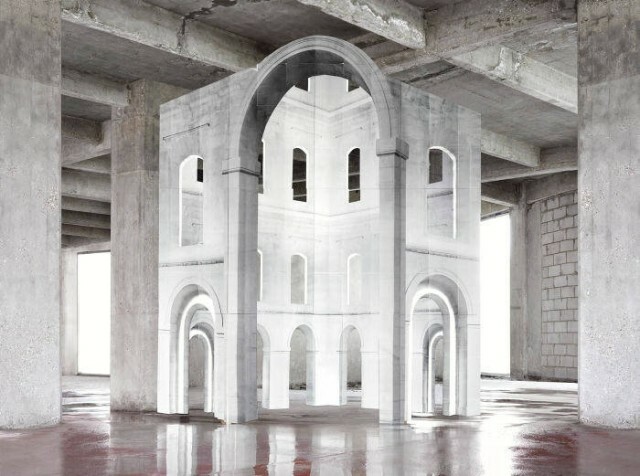 What is particularly uncanny is that Dujardin doesn’t use the extraordinary architecture of the spectacular; he builds the spectacular from familiar fragments of the everyday, from dreary (often Belgian) buildings. More unusual still is that Dujardin’s impossible architectures are now beginning to feed back into the real world. Recent images of Manchester’s The Factory performance space show architects OMA using a stacked industrial architecture clearly influenced by Dujardin’s work, blurring representation and the real. records the banal architectures of borders and industrial edgelands, decaying structures and fading communist-era architecture and subtly manipulates the context, removing lettering and signage or transforming the backgrounds from the exurban to the exquisitely rural. The effect is strange — believable, but perceptibly wrong. In a way they can be compared to the work of Thomas Demand, the German artist who constructs meticulous recreations of charged interiors from cardboard to make stage-set realities which, from a distance, look indistinguishable from reality but, on closer inspection, turn out to lack the detail, the grain, the patina and the imperfection of real life. Added to this is the nature of the spaces themselves which are often, despite their generic appearance, the sites of extreme violence or historical trauma — murder scenes or places of pivotal political moments — so that there are two moments of transformation: one at the realisation of the artifice of the “set”, the other on reading the caption and understanding the significance of the reproduced space. Beate Gütschow also plays with the familiarity of architectural imagery, using seemingly familiar elements to introduce moments of doubt. Are these buildings real? They certainly could be. Gütschow, like many of the others, manipulates us as much as she manipulates her images. The art and architecture worlds so fetishised the typographical work of Bernd and Hilla Becher and their “objective” photography of the otherwise banal elements of the post- industrial landscape that we have come to expect that objectivity. Very different is the work of Victor Enrich, the Barcelona-born artist who also takes the familiar architecture of provincial modernism and upends it through contortion and distortion. There is something very queasy about Enrich’s images, a destabilising of the familiar which makes us feel almost unbalanced. Enrich goes much further than the others. His blocks concertina and bend, they fly, they warp, they tilt. Towers look as if they’ve been unzipped. This is also the world of Christopher Nolan’s film Inception, in which a student architect is encouraged to play with the physical in the mind, toying with reality in dreamscapes, defying gravity and peeling architecture back. What started here has become a superhero movie trope: Dr Strange (2016) begins with an architecture made into a machine, cornices and dentils turned into cogs and gears and interiors turned into giddying geometric kaleidoscopes. Steven Spielberg’s film Ready Player One sees similar techniques applied to sci-fi slums, futuristic informality on a megacity scale. Lekan Jeyifo has meanwhile created an Afro-futurist version with megastructures manufactured from slum parts, rollercoaster shanties. Noémie Goudal makes her own dreamworlds, inserting concrete archi- tecture, often bunker-like, into sublime situations, perfectly reflecting calm lakes or exquisite skies. Espen Dietrichson works with the vocabulary of everyday modernism but then takes it apart, deconstructing architecture into its elements like a huge Ikea assembly diagram. His is a particular take on modernism’s obsession with panelisation and the idea of reproducibility, an architect’s dream of a kit of parts. There are others — too many to mention here but certainly enough to indicate the emergence of manipulated imagery as a new way of seeing the ordinary. If Thomas Demand appears to be one inspiration, the other is the German photographer Andreas Gursky. The world’s most expensive photographer makes epic images from the landscapes of the banal — supermarkets, Amazon warehouses, social housing blocks and so on. They appear as documentary images yet are carefully manipulated, breaking down the thin veneer of trust, the ridiculous idea that the camera doesn’t lie. But it also owes something to a new generation’s relationship to postwar architecture, to Brutalism and the civic spaces and social housing, the constructions of the welfare state now seen as distant and almost exotic in the era of neoliberal late capitalism. Much of this architecture is now being demolished to make way for generic, undistinguished commercial stuff with little sense of purpose and an architectural aesthetic designed to avoid offence. To this we should add the documenting, sometimes fetishising, of the landscapes of communism, which have been rediscovered by writers such as Owen Hatherley and photographers such as Frédéric Chaubin. Chaubin’s book CCCP — Cosmic Communist Constructions Photographed was a landmark in the coffeetableisation of a genre that had been celebrated mainly by the cognoscenti. These remarkable landmarks — the showpieces of late communism, the resort hotels and war memorials (explored in depth at Everything Is Con- nected: Art and Conspiracy, MoMA’s 2018 show on Yugoslav architecture), the civic sculptures and monuments to space travel — brought before us a half- familiar, eerie landscape of abandoned, epic architecture, its propaganda purpose now seemingly so distant. The architecture of the welfare state and the design of communist utopias were part of the same desire to make architecture mean something, for it to represent modernity itself, progress. Now architecture has been shorn of that sense of purpose and has become, largely, a tool of capital, it represents nothing and it has been left to artists to play with its remains. This art is a critique of the vacuity of contemporary architecture as much as it is a comment on the untrustworthiness of the image. But it also, perhaps, encourages us to look at the kind of architecture we might otherwise have been blind to — as a potential dreamscape, a field of potential and fantastic distortion. This emerging field depicts the strangeness underlying the architecture of our everyday and how it moulds our dreams. And our nightmares.